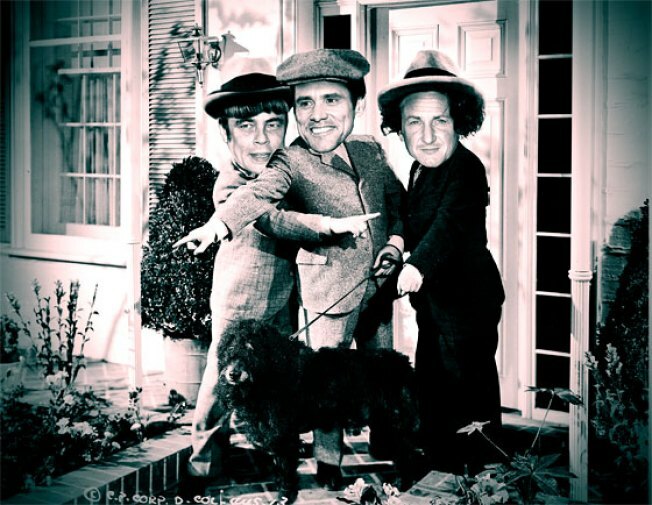 According to Variety, Sean Penn, Jim Carrey, and Benicio Del Toro are in negotiations to play Larry, Curly, and Moe in the Farrelly brothers' long-gestating Three Stooges movie, due sometime next year. Despite its cast's two Oscar winners, and the fact that non-winner Carrey hilariously plans to gain 40 pounds for his role, this won't be a dramatic biopic but a comedy loaded with eye-poking and nyuk-ing. As far as we can recall, this will mark the first time since 1982's Fast Times at Ridgemont High that Penn has attempted to be funny on film, and comedy may seem like a departure for Carrey to anyone who's seen any of his last ten movies. But we're most excited to see the movie debut of Benicio Del Toro's sense of humor, since, as far as we know, he doesn't have one.